On halloween, I didn't carve a pumpkin. $25 for a pumpkin?! you've got to be kidding. I eventually took to a vegetable with a knife. When I saw the lone capsicum sitting on my kitchen bench I was struck with a brilliant idea. Eat the capsicum? Oh heck no. 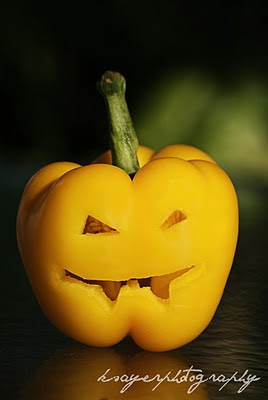 Grab a serrated knife and freehand a face on the capsicum? You betcha! Carving a pepper was probably 110, 000 times easier than carving a pumpkin. This was a much better idea than eating the capsicum in my opinion. They seem to be one of the few vegetables which I can't stand. and you have an excellent start to your week! because I have some things planned for the rest of the week! Mine would have to be cereal. I don't know how froot loops would go down. Plain cereals are my favourite, because it means I get to add whatever I feel like! I don't know if I "know" how to carve pumpkins, but taking to them with a knife seems like the logical thing haha! At woolworths they had MASSIVE crates of these $25 pumpkins and SO many people were getting sucked in!